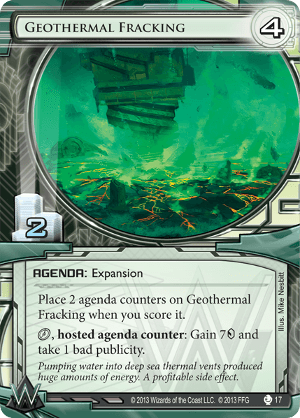 Place 2 agenda counters on Geothermal Fracking when you score it. click, hosted agenda counter: Gain 7credit and take 1 bad publicity. Pumping water into deep sea thermal vents produced huge amounts of energy. A profitable side effect. One cannot even glace at Geothermal Fracking without Hostile Takeover coming to mind. But, why play one over the other? Because the and bad pub to ratio is almost the same, does it really even much difference? Why yes, yes it does. The most apparent difference is that Hostile Takeover can trivially be scored from your hand. As anyone playing corp knows, this is a huge deal, and makes most people opt for HT without even giving GF a second look. Additionally, sacrificing HT to rez Archer isn't a big deal, while forfeiting the 2 points from GF to do the same is certainly an act of desperation. But, there are definitely a few places where GF outshines HT. Most notably, it's synergy with Titan Transnational cannot be overstated. Also, with the lower agenda density that GF affords, you can fit more ice to protect it or other agendas, or those oh so delicious money operations. Of course, no one is saying that you have to use one or the other, either. Why not use both, load up on the bad pub, and then try and score a Veterans Program or play Witness Tampering at your leisure? Or just ignore removing it altogether, embrace the bad publicity that is Weyland, and laugh at all those Anarchs with Faust as you sit behind your Patched Swordsman. Both cards have their places, and they're definitely not mutually exclusive.